Mixing music requires both technical ability and the creativity to try things that would make a song compelling and interesting to listeners. Mix engineers firstly possess the technical knowledge of audio signal flow, DAW and/or console operation, and how to use signal processors, whether in plugin or outboard form. Artistic ability and experience then determine what tools will be used when, where, and how. Like most skills, learning how to mix music begins first by understanding its basic elements. Level, or volume, is the first place to start when mixing. The level-to-level relationship between tracks will determine the overall foundation of your mix. 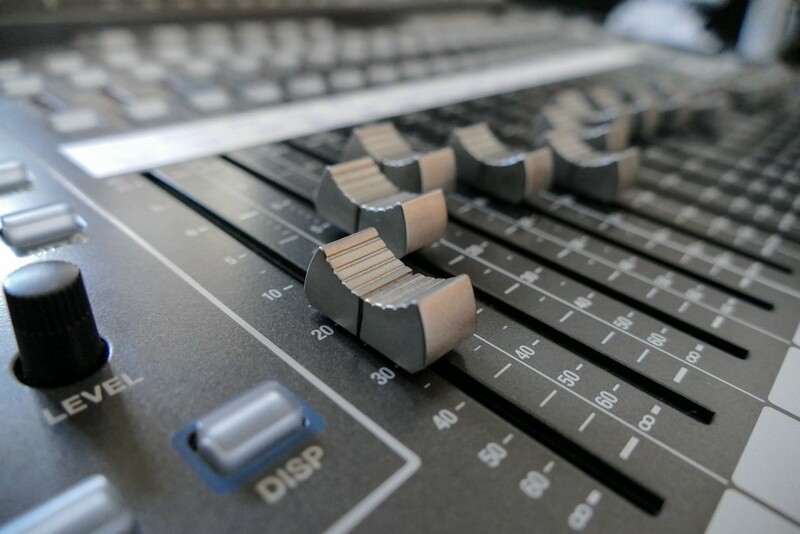 Once you begin to bring up faders, you’ll find a rough mix quickly taking shape! Start with the kick drum and work your way through the drum tracks until they’re nicely balanced. Continue with bass and the rhythm instruments before finally bringing in vocals and other lead instruments. Once you’re happy with basic levels, you can move on to the next element of your mix. Of course, great mixes don’t stop at simply leveling with faders. You’ll likely need volume automation at select points further in the mixing process, though you can keep things simple when first learning how to mix music. Panning allows mix engineers to place elements in the stereo field. Some panning tends to dictate itself, such as with drum overheads or multi-tracked rhythm guitars. Other times you can get a bit clever with it, employing automation or even auto-panner plugins! It’s good to keep in mind that panning is often used to create width. If you have multiple vocal harmonies, for example, they may sound rather flat stacked on top of one another. But if you move a track over to the left and another to the right, with a lead vocal sitting in the center, you will have widened your vocals and made them sound bigger. This concept can be applied to anything so long as it sounds good to you! Dynamics processors are used to control the volume envelope of a sound. Tools like compressors, limiters, noise gates, and de-essers are all examples of dynamics processors, which can control or smooth out the peaks and troughs of a given signal. Once you’ve established a rough mix with leveling and panning, you may want to start taming its dynamics. Noise gates, for instance, can be placed on various parts of the drum kit to eliminate unwanted bleed. You’ll probably apply compression, too, throughout much of the mix on many instruments, either as an effect or to control dynamics. If there’s ever a processor you’ll want to fully understand, it’s compression. Using it well can enhance a mix, though the opposite is true if its application is haphazard! As usual, trust your ears. If something sounds muddy and dull, try cutting somewhere around 250 Hz. If something sounds honky, try cutting an octave up, around 500 Hz. To make an element sound better, cut unpleasant frequencies. To make an element sound different, boost frequencies. And finally, you can’t boost a frequency that doesn’t naturally exist in the given material. Beyond the golden rules, EQ is extremely powerful and versatile. Surgical EQ can drastically improve an otherwise “okay” sounding instrument, and proper use of high-pass filters can massively improve the low-end content of a mix. It doesn’t stop there, though, as EQ use is limited only by your imagination and what sounds good! We’ve also compiled an EQ cheat sheet to understand where frequencies of interest live in a variety of instruments! The most commonly used time-based effects are reverb and delay. Using either or both of these can create an aural space for an instrument to sit, can add “excitement” to a track, can add depth and dimension to an instrument, or can push a track further back in the mix. To create an aural space, for instance, a great trick is to imagine the performer in an acoustic environment and to attempt to recreate what that environment might sound like by using reverb. Additionally, to make something sound bigger or more exciting, experiment with using small reverbs or short delays. To add depth or push a track back, use longer delays or big reverbs. Again, beyond just setting up a time-based effect return and sending a signal to it, you can automate various parameters to achieve interesting sounds. Experience and creativity will play a major role in how you decide to utilize time-based effects. Learning how to mix music certainly doesn’t stop at the fundamentals. We’ve provided an overview of the foundation here, but you’ll want to learn more advanced techniques as your skills and knowledge improve. By far the best thing you can do to improve as a mixer, though, is to practice, practice, practice!